Jim Ferguson (Alex Hyde-White), a young business executive, finds himself falling through a hole-in-time and is transported to the Western Front during World War I. While in 1917 Jim meets Capt. James Bigglesworth (Neil Dickson), aka Biggles, a British fighter pilot who has been assigned to uncover a secret weapon that is being tested by the Germans and could significantly influence the outcome of the war. Before Jim can figure out what is going on he is unexplicably transported back to the present and is confronted by a mysterious eldery British gentlemen (Peter Cushing) who has critical information for Jim about his time travelling abilities and Biggles' mission. 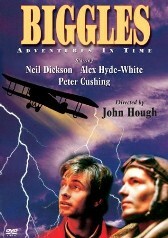 A low budget time travel flick from the mid-1980s, Biggles - Adventures in Time is based on characters from a very long running series of books (1932 to 1968) written by W.E. Johns about Biggles. The movie has little if anything to do with the novels, but its worth pointing out the connection. Biggles - Adventures in Time is short on plot, but the actors do rise to the occasion and perform a half decent job of selling the story. The film also suffers from seemingly not knowing who its audience is. The majority of the film is PG-rated, never quite going beyond family fair, but every odd scene there is a flash of something edgier going on with the occasional swear and adult scenario that might not be kid friendly. Personally I thought the film would have faired better had it been more adult in its tone and not pulled any punches. Jim's leaps through time in the movie are accompanied by freak electrical activity sometimes associated with storms while other times seemingly random. The special effects - fake lightning - when Jim's travels through time occur are laughable and date the film badly. I've mentioned this before in other reviews, but it's worth pointing out here again - time travel movies often unintentionally become their own time capsules. As is the case with this film, the special effects, the cheesey synthezier score, and the fashion of the contemporary characters all scream 1980s. Peter Cushing's character Col. William Raymond first shows up on Jim's doorstep accompanied by mysterious and creepy music. Dressed all in black and sporting a hat and gloves, Cushing looks like he is the one that should be travelling in time. Acting as a narrative bridge between the two eras, Col. Raymond provides both Jim and audience with the necessary exposition to keep the story moving. He explains to Jim at one point about the psychic link Jim and Biggles share as time twins as well as filling us in on Biggles mission. Col. Raymond's explanation of why Biggles mission is critical to the success of the war seems to imply that both the past and present are happening simultaneously and that if Jim is unsuccessful at helping Biggles stop the German's secret weapon the present may cease to exist as they know it. There is a flaw in the logic early on in the film when the Colonel arrives prematurely at Jim Ferguson's apartment asking him if anything unusual has happened to him recently. The colonel arrives before Jim's first leap through time which isn't the error. The error is in that how would the Col. Raymond know when and where Jim leaped from? Biggles would have been the Colonel's sole source of information on Jim. Unless Ferguson told Biggles the information who then passed it on to the Colonel its unlikely he would have known the approx. date or time of his first journey to the past. Biggles - Adventures in Time is not something that I would recommend, but as far as a mindless movie to watch if nothing better is on its passable. I know that sounds like pretty faint praise, but in my book its better being one step up from unwatchable and trust me there are more than enough time travel films out there that earn that ranking. Roger Harris presents two websites dedicated to the author W.E. Johns and his novels. Includes cover illustrations of all 98 Biggles novels as well as plot summary, chapter summaries and other publishing information. The ever useful Internet Movie Database entry for Biggles: Adventure in Time complete with cast info, plot summary, quotes, trivia, and release dates.